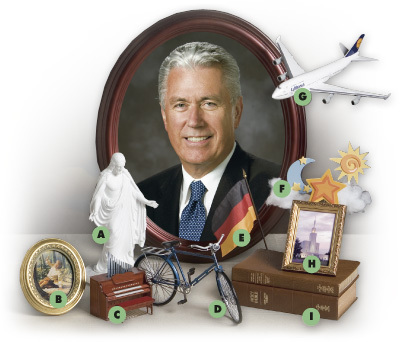 To learn more about Elder Dieter F. Uchtdorf of the Quorum of the Twelve Apostles, match the lettered pictures above with the clues below. ___ 1. Elder Uchtdorf was raised in this country. ___ 2. He is the first Apostle to be called in more than 50 years who was not born in the United States, but he says he was not called to represent a certain group of people. Like all Apostles, he represents this perfect man. ___ 3. As a child, he worked hard in the family business, pulling a laundry cart behind one of these. ___ 5. The Church building he attended as a small child had a stained-glass window depicting this event. Whenever the light shone through the glass, he thought about his testimony and developed a stronger appreciation for Joseph Smith. ___ 6. One of his first callings as a child was to pump this instrument so the congregation could sing. ___ 7. He married Harriet Reich, and they were sealed here in December 1962. They have two children. ___ 8. For 35 years he operated one of these. He eventually became chief pilot and senior vice president of flight operations for an airline. Adapted from “Elder Dieter F. Uchtdorf of the Seventy,” Liahona, Apr. 1999, F2–F4; see Friend, June 1998, 7–8; “Elder Dieter F. Uchtdorf,” Liahona and Ensign, Nov. 2004, 125–26. 1E (Germany), 2A, 3D, 4I, 5B (First Vision), 6C, 7H (Bern Switzerland Temple), 8G, 9F.